The two-door, four-seat Up is the first model in VW's new entry-level lineup. 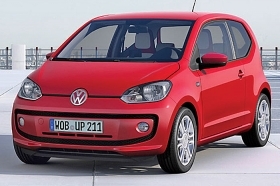 FRANKFURT -- Volkswagen will not sell its new Up family of small vehicles in the United States. "It is not our plan," said Ulrich Hackenberg, head of VW brand r&d at the Frankfurt auto show last week. "Technical adaptations are needed." The four-seat, two-door Up that goes on sale in December in Europe is the first model in VW's new entry-level lineup. In Frankfurt, VW showed six other Up concepts at the show including a four-door, an electric and a roofless "buggy." As VW sees it, the light-truck market, including SUVs and pickups, is again on the upswing in the United States, said Christian Klinger, VW board member for sales and marketing. "We are not sure it [Up] is the right size." Klinger said VW also is basing its decision not to import the Up on recent slow sales of the Smart ForTwo minicar. Hackenberg said there will be an electric Up next year and he later expects a compressed natural gas version. "We are also thinking about other types," he said. Because of the low price of the Up, VW is convinced it needs to produce the range in markets where it will sell the cars, Hackenberg said. That would eliminate long-distance transportation charges. Jonathan Browning, head of Volkswagen Group of America and the VW brand in the United States since last October, said a small car "is not as high a priority" in the United States where the brand has a target of selling 800,000 vehicles by 2018. Last year the VW brand sold 256,830 vehicles in the United States. VW is focused on increasing sales of vehicles designed primarily for the United States -- the Jetta sedan, U.S.-built Passat and the new-generation Beetle, Klinger said. These vehicles will be the core of VW's U.S. sales in the coming years, Klinger said, although "we will maybe bring other cars into the core."